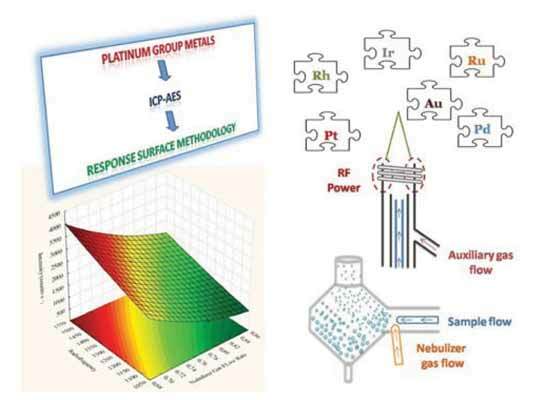 The special properties of platinum group of elements (PGE's), particularly platinum, palladium, rhodium, ruthenium, iridium and gold have many applications in anthropogenic activities. The importance of PGE's and gold led to the development of sensitive analytical methods to quantify them in different types of samples. The performance of an axial viewing 40.68 MHz inductively coupled plasma atomic emission spectrometry (ICP-AES) was examined by optimization of the operating conditions. Four parameters which influence the atomization process of the inductively coupled plasma (ICP) were studied, namely the radiofrequency power, the nebulizer gas flow rate, the auxiliary gas flow rate and the liquid uptake flow rate. Response Surface Methodology (RSM) with a Central Composite Design (CCD) and Derringer’s type Desirability Function were employed to construct prediction mathematical models and optimize intensity. Second order polynomials were eventually calculated and their power for prediction was evaluated. Response surfaces and Pareto charts illustrated the effects of each of the examined parameters and also of their interactions on the determination of the six analytes. The Desirability Function was employed for first time in such analytical methodology and proved to be an effective chemometric tool to typical tedious optimization procedures. Furthermore, it limited the necessity to arbitrary compromise the optimum settings for simultaneous multi-elemental, providing thus a reliable solution to this type of problem. PGE, optimization, DoE, operating conditions, RSM, desirability function. Lab. of Analytical Chemistry, Dept. of Chemistry, Aristotle University, 54124 Thessaloniki, Greece.